Today I’m hosting Chris Baier and Kelly Anderson, the producers of the upcoming documentary UNSTUCK: An OCD Kids Movie as well as incredibly supportive parents to children with OCD. The kids interviewed for the film will inspire you: They’re articulate and honest, and their stories will help spread awareness about OCD, particularly how it affects children. Stay tuned for the film’s release next spring! Chris, you have a 11-year-old daughter who has OCD, and Kelly, you have a 12-year-old daughter who has OCD. How did you realize your child might have OCD? Were there outward symptoms such as physical or time-consuming compulsions, or did your child approach you about obsessive thoughts, for example? Chris: My wife and I realized something was wrong when in the span of a few weeks Vanessa changed from a happy-go-lucky kid to extremely anxious and scared. She was 8 at the time and became frightened of things like small pebbles and trees on our street. She was convinced these objects were poison, would cause cancer and kill her. She was panicked all the time so we knew she needed help, but we did not know it was OCD until we talked with a licensed therapist. Kelly: My daughter is 12 and her OCD presented with some pretty visible and classic symptoms so I knew right away what it was. She is not in the film and I’m letting her figure out how much she wants to share about her OCD these days so I guess I’ll leave it at that! She is doing some drawings that will be animated for the film so she’s participating in that way. OCD is such a commonly misunderstood disorder. What did you know about OCD before your child was diagnosed? Chris: I knew about OCD and that it was serious, but I mostly associated it with being scared of germs or getting sick. I had no idea of the tangled web it weaves. Kelly: I have one friend whose brother has severe OCD so I was somewhat aware, but that’s nothing like confronting a severe case of OCD in your own child or family. Since you live in New York City, I imagine — and hope — that treatment resources abound. Was this the case, or did it take some trial and error before finding the help your child needed? Chris: In NYC there are plenty of therapists who say they treat OCD, but not many do exposure and response prevention (ERP). My wife and I had to do a lot of research about the disorder and one of the reasons it took weeks to get my daughter the right therapy was because we had to interview many providers just to make sure they were trained in ERP. There were none in Brooklyn so we had to take Vanessa to lower Manhattan each week. About six months into her OCD therapy we found a free group program at Mt. Sinai Hospital. This program, led by Dr. Ariz Rojas, transformed our lives. However, it meant traveling one hour each way by subway to get our daughter to the nighttime sessions. Kelly: My daughter was already seeing a therapist for some other issues, and that therapist confirmed that we were indeed dealing with OCD. We did ERP with her for a while, but eventually we decided to take advantage of a free group therapy clinic run by Dr. Ariz Rojas at Mt. Sinai Hospital here in NYC. Dr. Rojas specializes in OCD and her approach to ERP is very aggressive (I mean that in a good way!). We started seeing her privately as well as in the group, and it was tremendously effective in dealing with my daughter’s severe OCD. I would strongly recommend that parents of children with OCD seek out specialized ERP therapy if at all possible, even if it means traveling a distance for initial meetings and then continuing online. When one member of a family has OCD it can affect the entire family dynamic. What advice do you have for parents whose children have just been diagnosed, or for those who have been struggling to support their children for an extended period of time? Chris: OCD totally hijacked our family and figured out ways to manipulate and dominate everyone. As a parent, your first thought is to soothe and accommodate, but that’s the worst thing you can do. My advice for parents is to immediately start educating yourself on what OCD is and how it’s treated. Learning about the disorder became our second job. We read books, joined Yahoo groups, watched videos, joined the IOCDF and talked to a lot of people. We needed to understand as much as we could. Eventually, we started a parent group in Brooklyn because we needed to talk to people who understood what we were going through. Kelly: Learning how to be dispassionate when doing ERP homework with your child is very important. You need to get used to seeing your child in a lot of distress without losing your cool or over-identifying! I also learned that when I react to my child’s OCD with anxiety, it makes her OCD worse. It can be incredibly hard to stay calm and non-reactive, especially if they taking out their anger on you, but if you get upset it just makes everything worse. Finally, trying to be compassionate instead of getting angry at any OCD behavior is key. I found that a very important and difficult lesson to learn, but it’s made a world of difference. You met at a support group Chris runs for parents of children with OCD. How did you go from that initial meeting to collaborating on UNSTUCK: An OCD Kids Movie? Chris: Our kids both attended a weeklong OCD summer camp at Mr. Sinai Hospital. One day Kelly was driving her daughter and Vanessa home. The girls were talking about OCD in a very knowledgeable way and that sparked an idea. Kelly approached me about working together and I’m so happy she did. UNSTUCK is something that I think will help many parents and children. Kelly: I make films as my profession, and last year I had just finished a big project and was thinking about what to do next. I realized I was spending all my time reading about OCD, and it was hard for me to focus on anything else because it was such a big part of my life! The biggest obstacle standing in the way of making a film about OCD was my discomfort with showing kids going through ERP — I knew from experience that no parent would want the world to see their child in such a vulnerable position, and that the kids wouldn’t feel good about it either. I saw another film, Ellen Bruno’s Split, about kids and divorce, and I really liked the way the kids just talked about their experiences in an interview format. I knew Chris through the support group, and had noticed that he was passionate about connecting families and kids with OCD, and we came up with this idea of “kids as experts on OCD.” It’s been great working together on UNSTUCK: An OCD Kids Movie. The children who appear in your film inspire me! It took me years after diagnosis in my late 20s to start talking about OCD, and I still get nervous. Were there any obstacles to finding children who were willing to open up, and parents who were okay with that, too? Kelly: We are really indebted to several of our advisors who are mental health professionals — in particular Dr. Ariz Rojas at Mt. Sinai Hospital and Dr. Eric Storch at Rogers Hospital. They were willing to approach some families about participating in the film. We found other children through the OCD and Parenting Yahoo group. I am really very thankful to Vanessa and Jake, the first two children we filmed for the trailer. I think they inspired other kids to participate because they were brave and articulate, and potential participants could see how important it is for kids to hear from other kids who know what they are going through. I think it speaks to a greater level of acceptance of difference in general, and of mental illness and disability in particular, that kids are willing to tell their stories. These kids really want to help others with OCD — it’s amazing to hear them talk about why they want to be in UNSTUCK. You have an advisory board of professionals — adults — in the field. How much input have you gotten from children with OCD, and what’s been the most surprising, helpful, or enlightening piece of insight they’ve shared? Chris: We talked with probably 15-20 children and families before picking our cast. Every child we spoke with help us frame our approach. These kids and others in the OCD community really helped inform the discussions we had during filming. As for what surprised us, collectively two themes stand out. The first is the loneliness each child experienced when OCD was really bad. The second is the bravery each of them showed while learning to fight back. Some children have had to do some drastic things to get control of their lives. We’re in awe of their strength. UNSTUCK seems like a real labor of love. How does it feel working on a project that’s so personal, and how have you managed to fit it into your schedule? Chris: Schedule-wise, we set mini deadlines and I think that helped us stay on track even though we never had an official release date. First we wanted to get the trailer finished by winter 2016 so we could start fundraising and spread the word about the film. Then we planned a screening at OCD Con in July, which meant we had to film more children in order to have something to show at the conference. Now we’re focused on finishing by spring 2017 so that we can share it with the world. Kelly: It’s definitely a labor of love! We also were really fortunate to get some funding from the Kellen Foundation for it, so that has been really helpful. It’s always a challenge to get films made but we are really excited it will be coming out this spring! What can my readers do to help make UNSTUCK a reality? Chris: It would be great if people joined our mailing list on our site and/or like our Facebook page. This way they get first look at new content and get notified immediately when UNSTUCK is finished. Kelly: Well, we are still looking for donations. Every dollar will go toward getting the film finished and out into the world. We really want to do a big engagement campaign with it, showing it in festivals, conferences, community organizations, schools, and more. If you could share just one piece of advice with other parents of children with OCD, what would it be? Chris: I would say parents and caregivers should understand that they can’t magically fix a child. Kids have to learn the tools themselves. I found that the best thing was to become an advocate and cheerleader for my daughter. So, just find ways to help and support your child so they can focus on therapy. 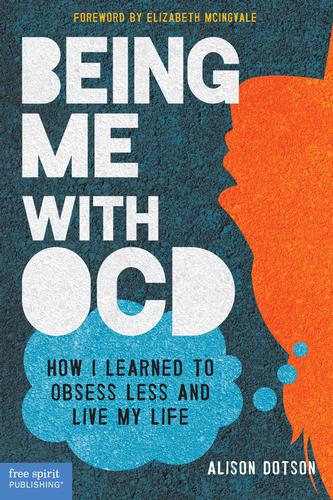 Kelly: Don’t blame your kid for their OCD even though it makes life miserable for everybody. They are dealing with a tremendously stressful mental illness and they need your love and support. And forgive yourself for the times you act in ways you regret — we are all only human! Do whatever you can to get your child to a cognitive behavioral therapist that specialist in ERP for OCD (the International OCD Foundation website can help you find someone qualified). That really saved our lives.